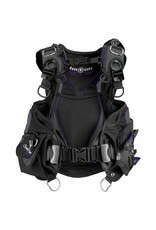 The Soul i3 is a luxury BC added to the women's line of quality dive products. 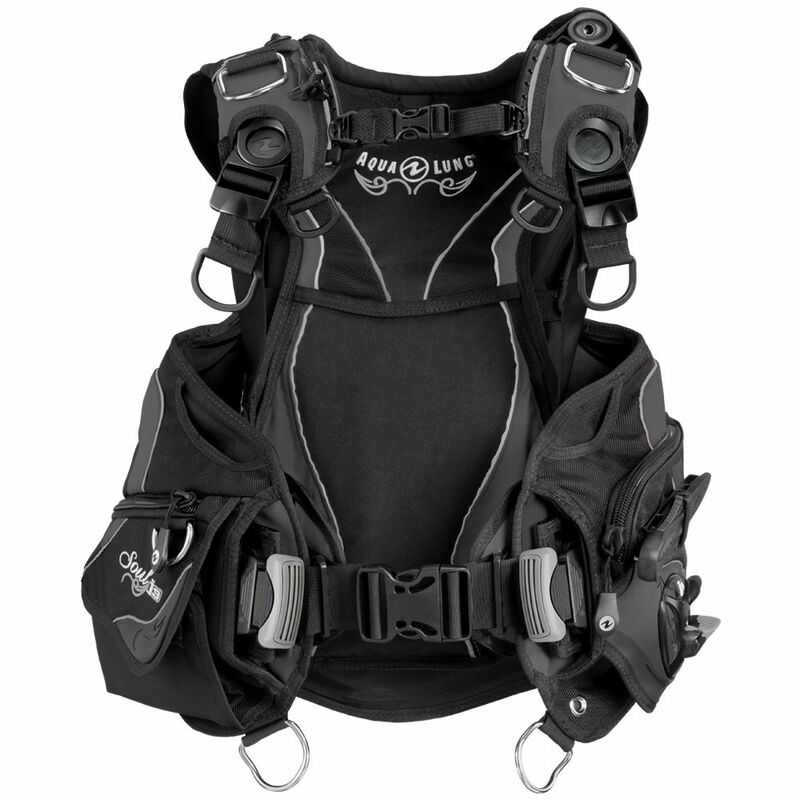 It incorporates Aqua Lung's most comfortable harness system to date, the Wrapture harness. The BC is powered by the intuitive i3 control system. Integrated weights are held securely in place with SureLock II mechanical weight system and the cylinder is secured with the GripLock tank band. The advanced air cell design has sleeker, lower profile lobes and a shorter torso length. 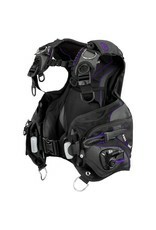 This hybrid design gives the best of both worlds, ADV jacket style combined with a back-inflation unit. Wrapture Harness System (pat. pend.) 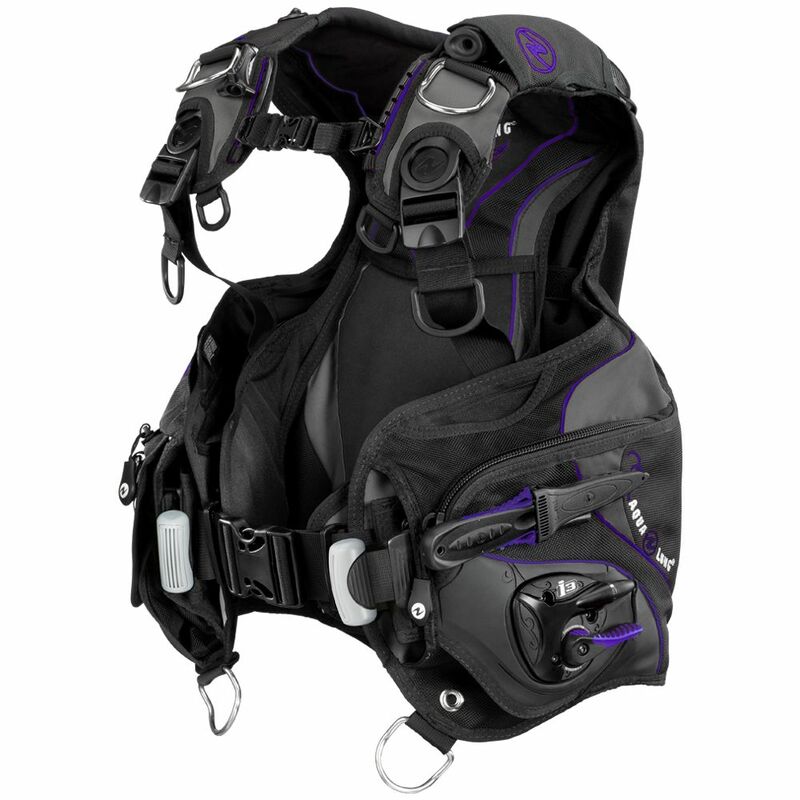 Using patented swivel shoulder buckles and a proprietary, ultra-thin back plate, the Wrapture provides unsurpassed comfort and stability. Wrapture prevents the BC from riding-up" on the surface. Out of the water, the Wrapture keeps the cylinder close to your center of gravity and transfers the weight to your hips. The result is the ability to stand up straight with a cylinder that is perfectly vertical. i3 Control System (patented) provides easy, one-touch control for inflation and deflation. Eliminates the traditional inflator that dangles at the end of a corrugated hose. i3 is simple and intuitive - just lift-up on the lever to inflate and push down on the same lever to dump air. What's more, when you push the lever down, all the dumps, upper and lower, open at the same time! Inflator comes with a 3/8" threaded low pressure quick-disconnect hose. The pull down oral inflator is easy to deploy, use and stow. SureLock II Mechanical Weight Release System (patented) provides a safe, single-pull release. Inserting weight is as simple as insert and click". With SureLock, your weights are secure in the BC. Once engaged, the only way to release the weight is to pull on the handle. The Sure-Lock II Mechanical Weight Release System with 20 lbs. (9 kg) Capacity. The Dimension also has fixed non-releasable weight pockets attached to the cylinder band with capacities of 10 lbs. (4.5kg). The GripLock Tank Band is a strong, secure way to attach the cylinder to the BC. Gone are the days of complicated web weaving through multi-slot buckles. Predetermined détente settings make set-up simple. No adjustments are necessary when switching cylinders of the same diameter. Best of all, you don't have to worry about pinching your fingers with GripLock's innovative finger saver feature (pat. pend.). A bladder retraction system is used to pull in the sides of the bladder during deflation. This keeps unit streamlined and reduces drag. An adjustable chest strap can be raised or lowered on a rail system. This not only ensures a good fit but also keeps strap from running across top of a dry suit valve. A scooped octo-pocket on the top, front of the right lobe makes it easy to stow and deploy an octopus. The octopus remains visible and accessible throughout the dive. Some divers may find it useful to run their instruments behind the left pocket and out the scooped opening on the top, front of the lobe. Pocket within a pocket A small security pocket is found on the flap of a larger drop-down pocket. Knife attachment points are found on the left lobe which will accommodate many of the Aqua Lung knives. This location provides easy access to the knife. BC features 5 stainless steel D-rings and 2 plastic D-rings for all your accessories. Right shoulder pull dump provides an additional dumping option. Rolled neck collar for comfort.